More than 1,000 acres of land along Kentucky’s Little South Fork of the Cumberland River were placed under state protection in August. In late 2017 and early 2018, these parks gained new territory thanks to land trust organizations and other donors. The U.S. Department of Agriculture’s program to increase bobwhite quail populations is expected to benefit farmers. The Russell Fork, which carved the gorge at the heart of Breaks Interstate Park on its path through through Virginia and Kentucky, is threatened by a proposed mountaintop removal coal mine in Dickenson County, Va. 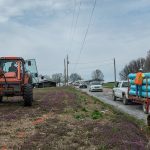 The new “Butterfly Highway” in North Carolina will create a series of stopover points with milkweed and other native, flowering plants for migrating monarch butterflies. Ridgeline corridors across a 67,000-acre area of Tennessee could be protected from surface mining. 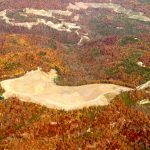 The U.S. Office of Surface Mining Reclamation and Enforcement is considering granting the state’s request for a ban. Submit your comment in support of the Cumberland Mountains before Jan. 25! Concerned citizens have joined together to monitor the Nolichucky River in East Tennessee for pollution that could result from a new industrial pipeline. Though the water is still at risk, opposition to the pipeline has spurred community engagement. To protect the golden-winged warbler and cerulean warbler, two conservation programs are working with private landowners. At the end of 2014, several regional land trusts finalized a host of easements, conserving views, habitats and cultural sites across the Appalachian Mountains.